Sport: 27th and 28th August. The weather has been mixed over the last 2 days being very windy yesterday and apart from a bit of a shower this afternoon it has been nice and warm today. There have been some reasonable catches made with the best areas being the dam and off Bell point. Terry Overy caught his 5 fish catch from Bell point on a dog nobbler. Mick Glancey landed 6 fish from the 2 trees area with cormorants on a floating line being his effective tactic. Ian King opted to fish at Grindys lawn and caught his 7 trout in all but a couple of hours. Ian caught all his fish on a muddler pulled through the waves. Today the best catch went to John Sykes with his 8 fish catch. John Fished from Bell point and barn quarry and caught on both diawl bach and daddies on a slow sinking line. Another successful angler today was Terry Wortington who caught 7 fish. He found his fish keen to take a diawl bach near the dam. See you on the water Paul. This entry was posted in Stocks Reservoir Fishing Reports on August 28, 2014 by staff. Sport over the last week has been variable which is a fair reflection of what the weather’s been doing. In particular the wind direction and, more recently, the wind speed have made the fishing hard for drifting boat anglers. 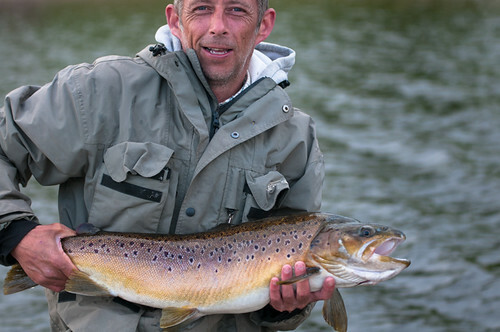 At times bank anglers have been bucking the norm and ‘outcatching’ those on boats. Putting the wind aside the success from the bank will also have a lot to do with the fact that the fish have been found very tight into the margins. Feedback via catch return slips demonstrates that various methods and areas have been producing good catches. Karl commented that he had a ‘great day’ fishing a floating line with hothead cormorants in Newclose Bay taking 3 fish in a half day session. Antoon Gysbers had 8 fish from Bell Point fishing a floating line with a foam daddy on the point and diawl back droppers, returning a couple of days later to catch 4 using the same method, both were half day sessions. Word was soon to get round and Bruce Irvine had a similar session to Antoons catching 6 fish, again from the Bell point area. Nearby at Hartleys Jo Halton fished diawl bachs to catch 4. Visiting Welsh angler Tony Gordon had 8 fish again from Bell Point fihing a woolly bugger dropper with a daddy on the point. Basically I think this all confirms that we are into the season of the foam daddy. From the boat John Barrat, from the west of Ireland, embraced the foam daddy method to fish in a near gale Irish Loch style to have a great days sport and easily catch his 5 fish bag and some. Interesting is that John favoured the windiest areas he could find to fish the foam daddy in the surf, his most productive drift being from the saddle, down the west side of Gull Island and into Newclose. Also from the boat John Sykes enjoyed a good days sport catching 8 fish from all over the water, washing lining various diawl bach patterns with an SSI. In summary; daddys doing well with trad’ wets on the droppers. The fish have been tight into the banks. Don’t be afraid of fishing in the surf the fish are going ‘mad for em’. Apart from the fishing we’ve had an Osprey hunting over the water but you’ll have to be quick because the seagulls are far from happy about it. I saw a Little Grebe on the res’ for the first time yesterday, having only ever seen them on the river up to now. THE BRIDGE is still closed in Newton however if you follow Back Lane from Newton to the pub in Slaidburn it only adds about 5 minutes (unlike the diversion that’s in place). This entry was posted in Stocks Reservoir Fishing Reports on August 26, 2014 by staff. Sport: 16th-19th August. After the super warm sunshine we have had for weeks there has been a definite drop in the temperatures especially at night. It would seem this has in turn cooled the water as we are seeing more and more good catches being recorded. Dennis Doogan fished the other day and caught a total of 11 trout. Dennis fished around Bell point with a floating line and a team of wet flies with a gosling being his best pattern. Antoon Gsybers only fished for a couple of hours this morning and landed 8 fish with his best being a 4lb 8oz rainbow. Antoon also found Bell point to be his best spot with both daddies and diawl bach taking trout. Derek Moore and Bob Fitzpatrick drifted all over the lake today taking fish in all areas from the dam down to the northern shallows and everywhere in between finishing with a total of 23 trout between them. Derek caught the majority of his fish on a cormorant whilst Bob found a red holo cruncher to be his best pattern. Hopefully the weather will behave and we will see more good catches being recorded. See you on the water Paul. This entry was posted in Stocks Reservoir Fishing Reports on August 19, 2014 by staff. Sport: The weather this week has kept all but the hardiest of anglers away. Today was the first day with decent conditions for fishing. This is reflected in the rod average. The water level has started to rise once again; it came up about 18 inches over Monday and Tuesday. Usually when this happens the trout start feeding over the newly flooded ground in margins on drowned terrestrials and on mountain minnows and this year has been good for both. At the moment though there are still plenty of trout out in open water. Today there were plenty rising for small black buzzers but you had to land the fly right on their noses to get a take. Gary Towers and Karl Frew got amongst them with black klinkhammers, yeollow owls they only landed 3 fish but between them they played another dozen. They just could get them to the net. They also had interest to black and gold humongous fish tight in. Their best area was Black House Bay and the east bank near David’s drain where they said there were loads of trout rising until the wind picked up. Unfortunately I cannot report on the best catch of James Nixon and D Nixon who had 16 trout between them other than to say they caught at The Dam. From the shore Diawl bachs have been most consistent with good catches coming from Bell Point and Hollins Point. Buzzers have taken some nice fish from the alders and Mr Haughton took 4 good trout from Newclose on a mosaic lure. The water temperature is cooling down now and with plenty more fish going in over the next few days, the sport should start to pick up dramatically. This entry was posted in Stocks Reservoir Fishing Reports on August 15, 2014 by staff. Sport: Thursday 7th August. After a cool start this morning it didn’t take long for the sun to burn through and we had a super warm summer day. A number of fish were caught today with various flies and tactics taking fish. Ken Whiteside fished the bank today and lost more hooked fish than were landed, Ken said he had loads of offers but the fish would not stick. Other anglers said the same thing including Mick Glancey who also hooked and lost more than were landed, Mick had lots of trout up to his midas dry fly. Jim Baron caught a few fish whilst fishing the bank at 2 trees and Hollins point with an olive cats whisker on an intermediate line being his best tactic. The best boat today was Peter Andrews and Stuart McCahie who netted 5 fish with dries and sinking line working but their best tactic was to washing line diawl bach. A few fish being caught but many more hooked and lost. Tomorrow they will stick. Ben stocked again today. See you on the water Paul. This entry was posted in Stocks Reservoir Fishing Reports on August 7, 2014 by staff.